(Tribune file photo by Brian Maffly) This natural gas processing plant north of Moab is served by a pipeline that Utah regulators ordered shut down on Friday, April 12, 2019, calling it a "hazardous facility" because of its operators' poor compliance with safety standards. If the pipeline goes off line, this plant could have to flare the gas it takes from a nearby oil field. The Public Service Commission on Wednesday ordered Pacific Energy & Mining Co. to cease moving gas through the 26.2-mille line, which it deems a “hazardous facility” and pay a $100,000 civil penalty. The action is the latest, and not likely the last, in a long-running effort by the Utah Division of Public Utilities to get Pacific, a Reno, Nev.-based company, to comply with Utah regulations. For example, Pacific could not show it has an adequate leak-detection system, according to division Director Chris Parker. In a letter sent Friday, Pacific’s lawyer Terry Spencer disputed the division’s conclusions, calling them “illegal,” and accused the agency of misleading the Public Service Commission and “covering up its own mistakes." The letter states Pacific responded to each of its notices “immediately or within the time periods allowed by the Notice” and the division relied on an unqualified inspector. The line connects Pacific’s oil field with the Northwest Pipeline north of Moab and is used to transport other companies’ gas production. Pacific built the 16-inch-diameter steel pipeline in 2008 at a cost of about $10 million, according to court records. It runs southeast from Pacific’s gathering system at Ruby Ranch Road near Interstate 70, tying into an interstate line where U.S. Highway 191 meets State Road 313 outside Moab. Along the way it ties into the Blue Hills processing plant near the Canyonlands Field airport. 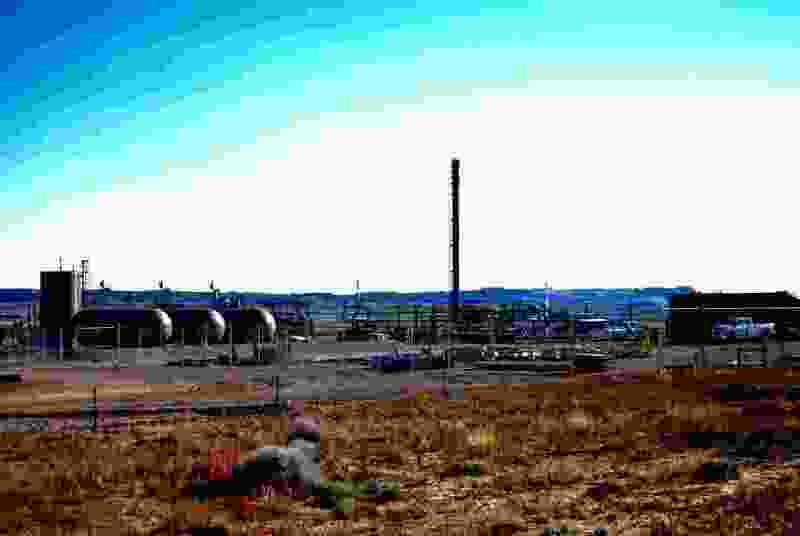 Fidelity Exploration and Production Co. built this plant in 2014 to process vast amounts of natural gas that come off its oil wells near Dead Horse Point State Park. Closing Pacific’s pipe could force Fidelity’s successors to either shut in their wells or flare off the natural gas. Spencer wrote that shutting down the pipeline will cost the state royalties and will cost Grand County tax revenue. The dispute with the Division of Public Utilities began when inspections in 2016 documented 13 violations, which pertained to informing employees and the public about emergency procedures, to leak surveys and to welder qualifications. The division initially sought a penalty up to the maximum $1 million because Pacific did not show “any good faith in attempting to achieve compliance," but reduced the penalty in light of the company’s financial losses operating the line. Eleven of the violations have yet to be remedied, according to the Public Service Commission order. “The gravity of the violations weigh heavy here, as they all involve pipeline safety issues, which, if left unresolved, could lead to catastrophic consequences involving human life and property,” the order states. Ahmad has battled not just regulators but also other operators and contractors. For instance, Fidelity sued Pacific over its refusal in 2016 to move gas produced by its successors Wesco Inc. and Kirkwood Oil & Gas through the pipeline. Pacific insisted on getting a $10 million bond as an assurance against damage to the pipe. The producers refused to put up the money and wound up flaring their gas at the Blue Hills plant because they could not safely shut in their wells, according to the suit. This drew the attention of regulators when a Pacific executive, posing as a Sierra Club activist, alerted the state. In an April 2016 letter to Ahmad, Utah Attorney General Sean Reyes blamed his company for the waste and ordered him to resume moving the gas. During this same period, Ahmad fought notices of violation issued by another Utah agency, the Division of Oil, Gas and Mining, that alleged problems with the company’s wells served by the pipeline. In response, Ahmad filed a formal complaint, alleging the division treated him unfairly and leveled false accusations against his company because of his race. The board dismisses his claim, concluding he provided no factual basis to support it.